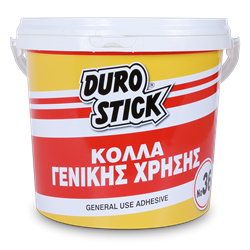 Affordable, general purpose vinyl based, white glue. Adheres and bonds together soft woods such as chipboard, MDF and hardboard, as well as cork and drywall. It also bonds polystyrene, cardboard etc. Ideal for bonding large surfaces such as laminated frames, Formica with chipboard, polystyrene panels or cork and chipboard covered with melamine. It is essential for bonding the upper and lower sides of carton boxes for the packing industry etc. Classified D1 per EN 12004. 180gr, 500gr, 1kg, 5kg, 30kg, 60kg.